I will never forget the first time I played The Legend of Zelda: Ocarina of Time. The game did something to me, and my entire perception of video games changed that day. So it has always shocked me that people who played the title for the first time later in life don't share the awe and wonder that so many felt when picking up that N64 controller for the first time and jumping into a 3D Hyrule. I have often accused people of wearing "nostalgia-goggles," but the truth is that no one is more guilty of that than myself in relation to Ocarina of Time. Instead of talking about why I personally love the game, I'm going to look more at what it meant for the industry at the time of its release and the mechanics it introduced. The Legend of Zelda was a series that, from day one, relied heavily on the mechanics of an overworld setting, with certain items or skills necessary to fully access new areas. When A Link to the Past released, the concept of dual worlds was fully introduced to the franchise. Ocarina used the basic framework from that concept and expanded on it, utilizing not multiple worlds, but multiple timelines. Ocarina of Time also was the first title in the franchise that made its characters, all of its characters, really matter. All non-playable characters in the game have a unique story, regardless of whether or not you can speak with them at length. And every character played a part, no matter how small, in the entire story of the game. Traveling through time allowed you to see the evolution of certain characters. Characters age, and some die. Some become more powerful and some fall from grace. You also learn more of Link's backstory - his family history, how he came to live in Kokiri forest, and his ultimate destiny. Ocarina of Time added meaningful narrative without taking away from gameplay by showing characters leaping from youthful ignorance to the burdens of adulthood. The love of the game for many is not based exclusively on the storyline, however, but also the innovations that the title granted at the time of its release. Let's start with the setting. After moving on from an entirely 3D Kokiri Forest to the entirely 3D vast land of Hyrule, you are greeted by amazing scenery. An intimidating volcano with a halo of clouds, a sprawling farm, a massive castle. The environment was more than just visual, however - everything you saw, you could access. The backdrop of Ocarina of Time was not just in place to make the game prettier, it was a promise of what was to come. While there was plenty of empty travel in the game, there was no teasing. If you could see it, you could reach it. Compared to newer titles, like The Witcher 3, Ocarina is tiny. But at the time of its release, the game was massive. Every place you visited had mini games, side quests, and hidden secrets - and once you traveled ahead in time, you were discovering even more. Ocarina not only offered a visually impressive 3D environment, it also made that environment meaningful. And it did so with a day-night cycle that offered new and unique challenges based on the time of day. 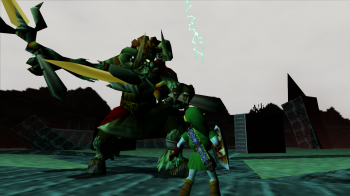 Quite possibly the biggest innovation Ocarina offered was the utilization of Z-targeting - the ability to lock onto a specific enemy in order to focus your blows, regardless of whether you're using a sword or a projectile - with the option of quickly switching between multiple enemies. Many RPG, adventure, and action games adopted the mechanic because it served as a simple way to manage multiple enemies. Target locking is so common in games today, if you happen to jump back and tackle Ocarina of Time now you'll likely end up unimpressed. In 1998, however, it was a technological triumph. 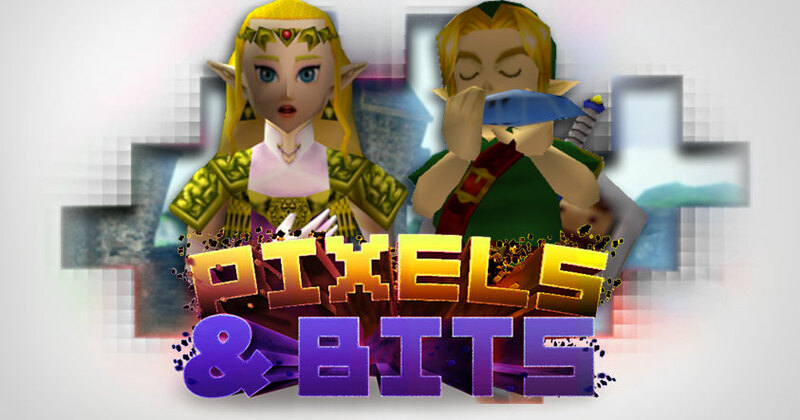 If you're playing Ocarina of Time for the first time today, it's unlikely that the game will be profound to you, as most of the mechanics it introduced have already been implemented into more modern titles. If you played in 1998, however, the sense of wonder, discovery, and newness likely not only hit you, but stuck with you. This is why Ocarina is so widely regarded as one of the most important titles of all time. The game itself didn't need to hold up well over time, because what it introduced to the industry as a whole already has.